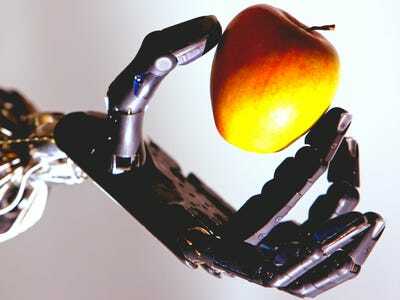 Jeff J Mitchell/Getty ImagesThe Shadow Robot company’s dexterous hand robot holds an Apple at the Streetwise Robots event held at the Science Museum’s Dana Centre on May 6, 2008 in London, England. That sort of hubris must have been found in an Apple fan video or something, right? Not quite. It’s something that Apple actually allowed James Manyika of the McKinsey Global Institute to say during one of its WWDC videos. Just for reference, the industrial revolution was the first sustained and dramatic increase in material wealth for a majority of people in any country. People had become more prosperous before in history, but not in such a widespread, long-lasting or technologically striking way. In the long run of history, the industrial revolution bridges the gap between you, in a modern and productive economy, and the often hand-to-mouth agricultural existences your ancestors had for thousands of years before. Now, I agree that the App Store is nice. Really nice, in fact. Sometimes I don’t know what people did before CityMapper existed. But I feel like Apple might be misjudging the proportions a little here. Manyika mentions how rapidly the App Store was picked up around the world as a follow-up justification, contrasting it to the spread of electricity (which took centuries). That seems like it’s piggybacking on the achievements of others just a little bit — the App Store wouldn’t actually work very well if there wasn’t any electrical infrastructure. But that’s missing the point a little — basically, anyone who thinks the App Store is more transformational than electricity or mass production should try going without those things (and their products) for a week, then try without apps, and see which is more difficult for them. Just FYI, Apple, the Enlightenment was already a thing, and it met the industrial revolution in the late 18th century.